Certainly not for the faint-hearted, this is a big, bold and utterly dramatic piece of neck candy that can't help but get you noticed. 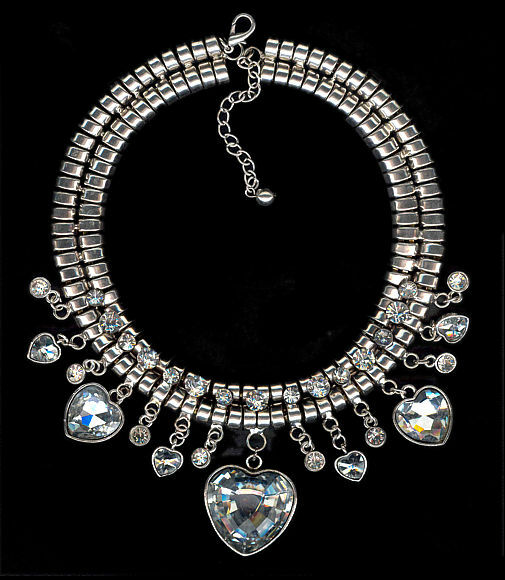 Features a flat collar, studded at the front with sparkling rhinestones, from which dangles a large heart at the centre, two medium hearts, four smaller hearts and a myriad of circles. Length: 42cm (16½") + 10cm (4") extension. Collar width: 2cm. Large Heart 3.5cm (approx. 1½").